I am writing this as we head on down the highway to Madtown to watch UND play in the home state of Derrick LaPoint. Hopefully it will be a great homecoming for him! Last week was a lost opportunity. The Sioux took care of business on Friday night with a gritty win over the unbeaten Bulldogs of Duluth but on Saturday night let two points (or a minimum of one) go. The second game went into overtime and with the D pinching they got caught on an odd man rush and gave up the game winner. The behind the back pass by the Duluth player was very nice but was the result of an awful play by our defensemen. I have never played the game, yet alone coached hockey, but I have watched enough Sioux hockey to know that when you are on defense your first job it to keep the other team from scoring. Getting caught with the puck behind you never works out well if you are supposed to be guarding the blue line. Everyone on this team must work as a team to win, no one person will ever bring home the eighth National Banner on their back. Freshman to Senior, Captain to reserve player must never forget this fact! This was two points squandered. Now on to the Badgers, we are looking forward to a great weekend with the LaPoint family in their home state. Thanks to Nate for the tickets!! Although UND needs a sweep that really cannot be expected in the Kohl Center. 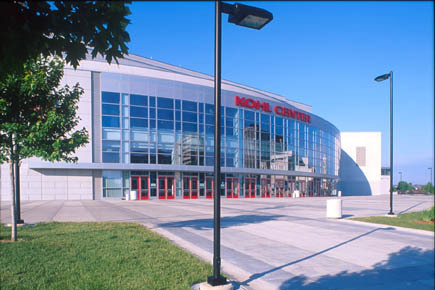 Of all our travels this is our favorite arena as the atmosphere is awesome. The student section is so much fun to watch. I wish some of our students would take notes and bring their level up to that of the Badger faithful. My prediction is a split with UND finally winning on a Saturday night. Next week we head to Omaha with our Nate, his friend Phil along with the Narums and Haugens. 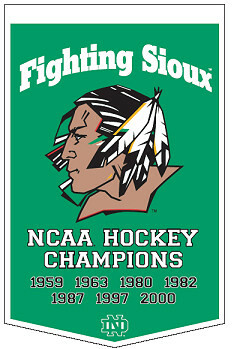 Kyle and Vanessa are flying in from Denver to meet us so it should be another great weekend of Fighting Sioux hockey.